PABUG Box Lunch @ Live held April 8, 2014 Anaheim, CA: As always, we take time during our box lunch to meet with one another, review the past year, plan for the upcoming year, and recruit volunteers. We appreciate the strong attendance and feedback we receive during this event. Officers Retreat and Track Leader Retreat held May 5th & 6th, 2014: Our retreat is the kick-off to our planning season. PABUG.org moved to a new home during the summer of 2014. As a collective body we decided it was time to have our website and core resources be independent of any college or university. We now run a WordPress site hosted by T1 Hosting. At the same time we implemented an actual Listserv that our members can use for collaboration. Tech Day was hosted by Dickinson College on July 31, 2014 which brought together close to 50 attendees as well as strong representation from both Ellucian and Oracle. The annual PABUG Fall conference was held November 24th & 25th, 2016 as a celebration of 15 years of success. 510 attendees (record attendance) over a two day period came together to celebrate 15 years of knowledge sharing, exchanging of lessons learned, catching up with old friends and making new ones, to discuss the growing pains of our institutions, rejoice in our successes and commiserate with one another over our frustrations. With 52 sessions offered Monday and 45 on Tuesday attendees had plenty to keep them busy. To commemorate 15 years PABUG hosted a 15th Anniversary Reception complete with DJ, Photo Booth, several food stations, and an open bar. During our event we took time to recognize our first Emeriti Award Recipients; Manny Pena (Lehigh University), Cindy Bilger (Bucknell University) and Cathy Connor (Villanova University). Our goal with Emeriti awards is to recognize those individuals who have dedicated countless voluntary hours to the organization over the course of several years. All three of our 2014 award recipients have supported PABUG since its inception in 1999. 252 attendees joined us for our Anniversary Reception celebration. 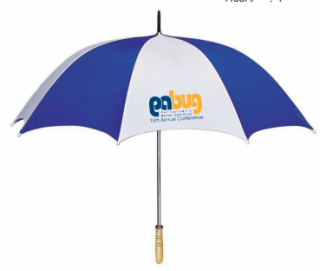 Conference attendees also received an umbrella to mark 15 years of success. Thank you to Jack Kramer for providing another informative Science lesson and I would be remiss if I didn’t call out Kevin Waterman with Ellucian. It’s through Kevin’s time and dedication to our organization that we are able to reap the benefits of face to face conversations with so many talented Ellucian representatives. 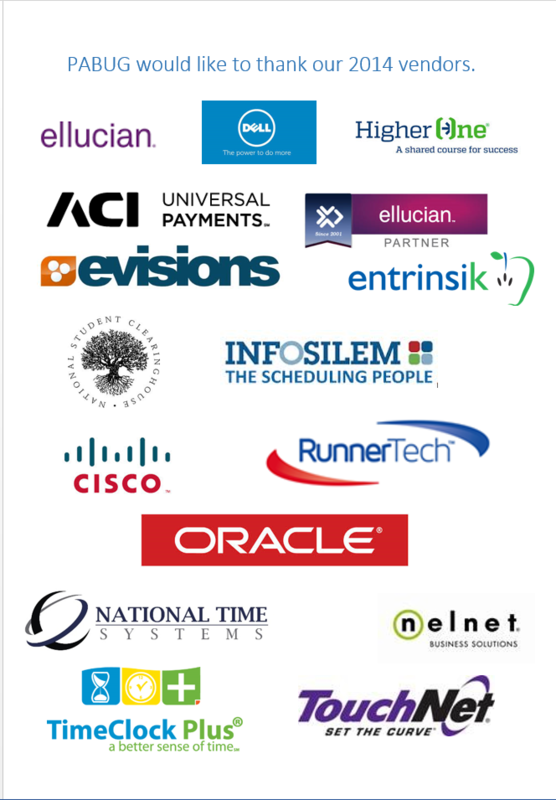 Our organization was very pleased to have 16 Ellucian partners fill the vendor hall this year. Their continued support is an integral part of our success. Our conference was able to go green as we implemented a new mobile app, developed by JCMPLabs, allowing us to have all of our conference information at your finger-tips. Additionally we moved to digital schedule displays in lieu of paper schedules. It was a pleasure to work with all the 2014 volunteers. Every one of the volunteer’s gives 110% and without them PABUG would not be the success that it is. They made planning the conference easy and my role as president an enjoyable one.